President Barack Obama has enjoyed a surge in Facebook “likes”, thanks to a co-ordinated social media campaign. President Barack Obama’s page received more than one million “likes” in a single day – compared with about 30,000 per day in earlier weeks. But some observers warned the approach could frustrate and dissuade voters. It comes at a time when both President Barack Obama and Republican candidate Mitt Romney are stepping up their efforts on social media. The opponents each have a presence on a host of digital communities, including streaming music service Spotify, image-sharing network Pinterest and the Facebook-owned picture network Instagram – where Mitt Romney has been busy posting pictures of himself at home with his family. But users were quick to voice their annoyance as President Barack Obama campaign advertisements and messages appeared within Facebook news feeds. Dr. Sandra Gonzalez-Bailon, from the Oxford Internet Institute (OII), said that this kind of campaigning was part of a transition period – which Facebook users may take some time to get used to. The growth comes as Barack Obama and Mitt Romney look to ramp up their use of digital and social media ahead of November’s vote. In 2008, Barack Obama’s campaign was praised for its innovative use of social media to engage young, often first-time, voters. President Barack Obama took to answering questions on popular link listings site Reddit – a move that went down well with the site’s clientele but was dismissed as a quick-win publicity stunt by his detractors. The president has even had his team place adverts within video games. The top-selling American Football title – EA’s Madden NFL 13 – had images advertising President Barack Obama’s website, voteforchange.com. Other EA titles – including the classic Tetris – were also used to promote Obama’s campaign. Mitt Romney’s campaign team told American broadcaster NPR they too had used video games for advertising. “The findings represent a national statement of concern,” said Prof. Joseph Turow, lead researcher on the study. Sandra Gonzalez-Bailon said that politicians – and indeed anyone using social media to advertise – must be wary of a “red line” that should not be crossed when dealing with worries of intruding into people’s private digital lives. She recounted an incident in 2004 when Italy’s then-prime minister Silvio Berlusconi’s office sent out text messages reminding people to vote in upcoming elections – causing a political row in the process. “Receiving a text message on your mobile was a way more serious transgression of your private sphere than seeing a sponsored ad on Facebook,” she said. 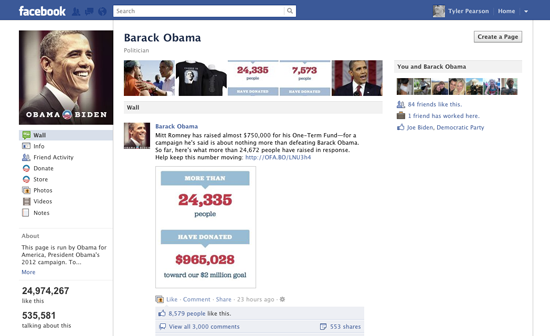 President Barack Obama’s campaign team used Facebook’s Sponsored Stories function to place their paid-for messages. However one lawsuit, which the social network has been fighting since 2011, said the feature was violating Californian law by publicizing users’ “likes” without compensation or a way to opt-out. Facebook’s proposed settlement in the case amounts to $20 million and would allow for individual users covered by the ruling to claim up to $10 each in compensation from the company. The proposed settlement also outlines new ways of making it easier for children on Facebook to opt-out of the Sponsored Stories feature.